Flea markets, Gumtree, and even a neighbour's curb can yield vintage treasures that make a house sparkle. But knowing what to do with those pieces can be intimidating. 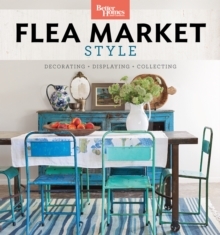 This innovative book shows homeowners how to use flea market treasures to transform a home. You will learn how to seamlessly combine pieces into a cohesive space that truly reflects your style, whether Cottage, Bohemian, Midcentury Modern, or something else. The book also includes helpful information on how to display and use esoteric, fun, and one-of-a-kind collections. Several DIY projects explain how to create fun new pieces from flea market finds, such as wall frames from vintage hand mirrors.